The 2017 Toyota Corolla is one of the best sedans on the market today. It’s well-equipped and incredibly efficient. Best of all, it features a dependable reputation, making it an ideal choice for both small families and first-time drivers in Avon, Indianapolis, and Plainfield. The 2017 Toyota Corolla is one of the most luxurious sedans on the market, and that’s clear as soon as you get behind the wheel. In this car, you’ll find everything from an available premium audio system to power-adjustable seats to help you enjoy the road ahead. It also comes with an automatic climate control system and heated front seats for enhanced comfort. o date on the latest headlines, and even see how traffic is on the way to your destination. The 2017 Toyota Corolla may be a sedan, but it still has tons of space for your carpool groups and your family. 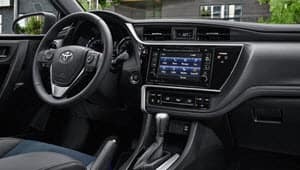 Overall, the Corolla has 97.5 cubic feet of passenger volume with 42.3 and 41.4 inches of front and rear seat legroom, respectively. It also has 13 cubic feet of trunk space. If you need even more room for all your luggage and cargo, use the sedan’s 60/40 split rear seats. Fold one seat down to slightly extend the cargo capacity, or fold down both seats to fit those extra-long items. When it comes to performance, the 2017 Toyota Corolla produces more than enough power to get you to wherever you need to go. It comes standard with a 1.8L 4-cylinder engine. When paired with a Continuously Variable Transmission with intelligence and Shift Mode, the engine can get up to 132 horsepower. If you want a more athletic performance, check out the Corolla SE and XSE. These trims feature available paddle shifters that deliver quick gear changes for a more responsive ride. They also offer available Sport Mode. When engaged, it will adjust the Engine Control Unit and simulated shift points to deliver a sportier ride. The Corolla LE Eco also comes with the ECO Mode button. This performance feature configures the gas pedal output and air conditioning to optimize overall fuel economy. From outstanding fuel economy to advanced safety and infotainment technologies, the 2017 Toyota Corolla has everything you need for a convenient and entertaining ride. So, if you’re in the market for a dependable sedan near Avon, Indianapolis, and Plainfield, test drive the 2017 Toyota Corolla at Andy Mohr Toyota now! Priced below KBB Fair Purchase Price! Corolla LE, 1.8L I4 DOHC Dual VVT-i, CVT, FWD, Blue. Blue 2017 Toyota Corolla LE 4D Sedan 1.8L I4 DOHC Dual VVT-i FWD 28/36 City/Highway MPG Visit us at: 8941 E. Highway 36 Avon, IN 46123 By Phone 317.713.8181 or www.andymohrtoyota.com. Corolla LE, 1.8L I4 DOHC Dual VVT-i, CVT, FWD, Red. Red 2017 Toyota Corolla LE 4D Sedan 1.8L I4 DOHC Dual VVT-i FWD Odometer is 7594 miles below market average! 28/36 City/Highway MPG Visit us at: 8941 E. Highway 36 Avon, IN 46123 By Phone 317.713.8181 or www.andymohrtoyota.com.